Verizon offering early upgrade to certain customers? 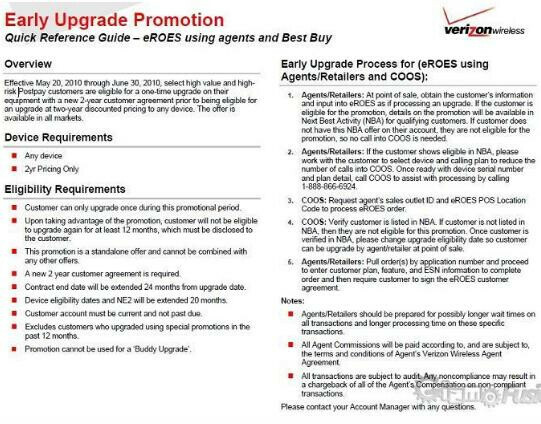 According to internal Verizon communications, from May 20th to June 30th of this year, select "high value and high risk" postpay customers will be eligible for a one-time early upgrade. By signing a 2 year contract, the customer will be allowed to upgrade his/her handset for the subsidized contract price. The offer is good toward any phone model, and the customer can upgrade only once during the promotion period. If the early upgrade is used, the customer cannot use another upgrade for at least 12 months. To be allowed to use this promotion, the customer's account must be current and not past due. So if you have your eye on that Droid Incredible but your figured you were months away from the lower upgrade price, might as well check with Verizon to see if you qualify for this special offer. The worst thing that could happen is that they say, "No". The best thing is that you end up with one of the best Android phones on the market. It's called, "Please don't switch to the new iphone! You are too profitable for us". I've been with Verizon for a couple years now, they usually let me upgrade every 11-12 months anyway (usually every December). They've never given me an issue about ugrading on my 11th month. With a 1 year contract you can upgrade every 9 months. I'd imagine they would with that $300+ early termination fee. Correct gemini, but the Palm promotion is actually only redeemable by Premium Indirect Agents and not Corporate locations. Atleast that is what is it like here in the midwest. ive been with VZW for years and ive never had to wait 2 yrs to upgrade. always been able to upgrade every 12 months or thereabouts.